You know that there’s a difference between generations because of the art of refutation. Most young people know jack, but they pretend that they know a lot. The consequence of this is that they hardly ever engage in refuting conjectures. This is another way of saying that they are not very good at prediction. They can’t guess correctly what happens next based on observing reality, so they often end up in a depressive ditch, where they wallow in the attitude that’s called: ‘Others don’t understand me, I’m different’. Older people are more capable of filtering information, and because there’s less of it, it’s easier to process information and turn it into applicable knowledge. This means that not only are older people better at figuring out what works and what doesn’t, but they’re also more able to refute the inessential, even when the inessential is part of the attitude that’s called: ‘I’ve always thought this, so there’s no reason to change’. Of course, there are young people who are intelligent and thus able to navigate their environment, adapting to what is and not merely chasing after what isn’t, and there are also older people who are dogmatic and conservative, who never dream of refuting what they once decide is the case. I’m having these thoughts while looking at my cards today in conversation. The Queen of Clubs zooms in on social relations, suggested by the presence of the 8 Hearts. The Ace of Spades and the Ace of Clubs align with the Ace of Diamonds on the vertical axis. She nods pensively. We end this discussion with me telling her that she’s old enough to know the value of honesty, and her thinking about the pressure from her social environment to play a role she would rather not. Applying honesty to an environment that cultivates hypocrisy is risky business, but it pays off to think about what you’re good at, and hammer that to the table, whether this be the social table or the private expression. Adaptability is not about being nice or being a contrarian. It’s about the ability to predict the odds and act in accordance, even when it’s in your detriment to do so. You can step up to your personal courage, refute what’s not real, and take the fall as a consequence. If you’re not ‘social’, meaning, you do what everyone else does as a matter of ‘adapting’, you have slim chances at succeeding in a place where everyone is invested in making everyone else feel good in spite of what’s actually essential to address. The question to ask now is this one: Who wants to succeed in a place that cultivates false interests? The art of refutation is a subtle representation of knowing your place, and hence of highest wisdom. Stay in the loop for cartomantic courses. 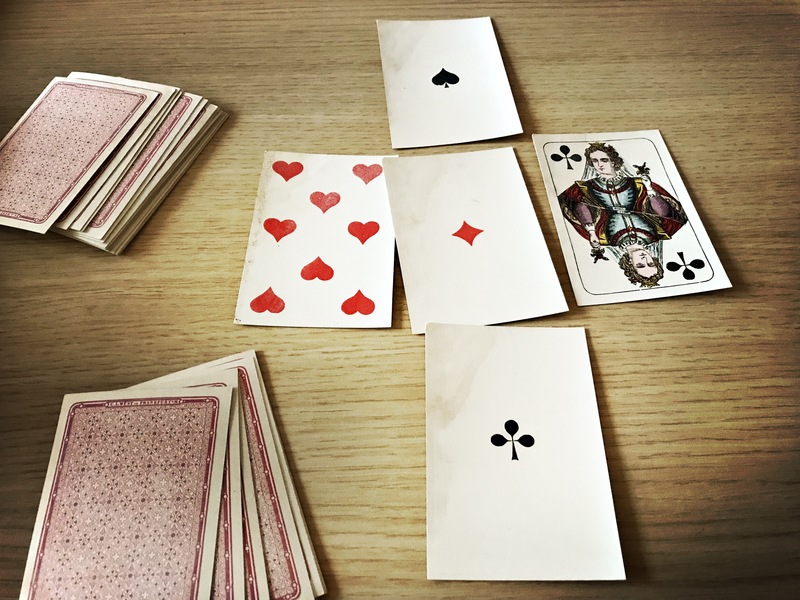 The Playing Cards Foundation Course opens for registration in 2 days. Learn how to think and read in sophisticated ways by looking at 4 suits of color.